Over the years, I’ve often thought about the power of brief encouraging words spoken to us and by us. When I was a student at Multnomah Bible College, one of my favorite theology professors, Dr. Joseph Wong, scratched on my term paper: “You should consider being a writer.” I took it to heart, and over 40 years later I’m still grateful. In the ‘70s, I began writing magazine articles, including for Moody Monthly and Eternity, two then-popular Christian magazines. As a pastor in the ’80s, I started writing a book addressing the problem of sexual immorality among Christians. In 1985, my first book was published, Christians in the Wake of the Sexual Revolution (now out of print). Since then I’ve written over 50 more, the royalties of which are all given away to worthy ministries (nearly $8 million to date). No one is more amazed than I am that there are now 210 different translations of my books in over 70 languages worldwide. I also thank God for how He has sovereignly used the books in such surprising ways. He’s touched lives by the power of His Holy Spirit through the words themselves and through the royalties—which fund ministries and in turn enable them to touch lives for Christ. 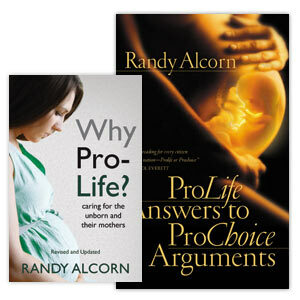 Your book on abortion, Why ProLife?, helped me find the courage to talk to a friend and keep her from having one. Plus, the proceeds from those books go to prolife efforts that save other lives and help other women. In fact, Prolife Answers was the first book I wrote after I had to resign as a pastor due to lawsuits from an abortion clinic. And that book ended up being widely used to train thousands of prolife advocates. When I think of those abortion clinics, I remember Joseph’s words to his brothers, “You intended it for evil, but God intended it for good, to save many lives” (Genesis 50:20). I’m a Business Science student at the University of Cape Town in South Africa and I’ve often wondered how we, as soon-to-be professionals, are to manage our money faithfully. 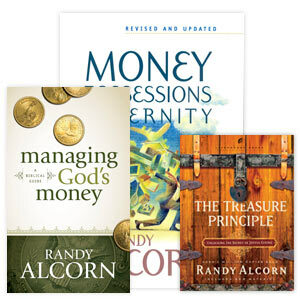 Managing God's Money has really helped me to see how God expects us to use HIS money. The royalties from those books feed and equip the needy. Over the years, we’re grateful to have been able to give over half a million dollars to relief ministries working to alleviate suffering and poverty. I just finished reading Heaven. It has profoundly changed my life. I had an embarrassingly dismal view of Heaven, and was reluctant to die and leave this earth. I desperately hated to leave beautiful places thinking I would never see them again. In the three days it took me to read your book my knowledge of Heaven now and Heaven to come, my understanding of and relationship with God, my view of this world, the people in it and opportunities for service have been transformed. For the first time in my life I am excited about my future Home, and galvanized to make the most of my days here on earth in preparation for it. The royalties from those books also go to support missions and translate God’s word into the languages of formerly unreached people groups. With royalties from the books, we’ve had the joy of funding, by God’s grace, an entire Bible translation for a language spoken by a few million people, with another in progress. I anticipate meeting people one day in the presence of Jesus who will tell us that they came to Jesus through these Bibles in their heart languages. The Lord used Safely Home to draw my heart to the knowledge of our precious persecuted brothers and sisters – and more than that, the worth of Jesus Christ. I can recall this season in 2006 as if it happened yesterday. The sleepless nights and times of prayer (and later trip to China) came from this new awareness and sealed my decision to be spent among unreached and persecuted people in Asia. I am 31 and single, and leave in a few months to give the rest of my life in India. One hundred percent of royalties from Safely Home go to help persecuted Christians and to spread the gospel in their countries. Thanks also to all who have supported Eternal Perspective Ministries over the years (some from our very beginning 27 years ago this month). You enable our staff to do their work, including me as I write, freeing us up to continue giving away the royalties to strategic need-meeting efforts across the globe. If you’d like to consider partnering with us in this eternity-changing ministry, you can learn more here. The greatest joy, and my highest pleasure today, is to know it’s all about Jesus: “For from him and through him and to him are all things. To him be glory forever” (Romans 11:36). Most writers won’t sell a lot of books. But I encourage those Christian authors who do sell a large number to give away most or all of the royalties to God’s kingdom, and to recognize they belong to Him. I’ve been asked over the years, “Why don’t you fund Eternal Perspective Ministries through the book royalties, and not receive donations?” It’s a reasonable question, and there are two main answers. 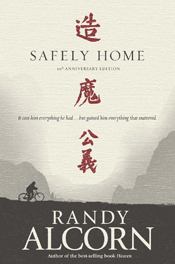 We love the fact that God uses Randy’s books to change people’s lives in two ways: through the reading of the words and through the giving away of the royalties. Here's just a few of the many book responses we've received over the past 25 years.